Almost two years ago, I upgraded to a Home Theater Master MX-500 remote from Universal Remotes in preparation for getting a DVD recorder that would not have been very compatible with the re-badged SL-9000 remote that came with my Model 950 surround processor. The MX-500 is a great remote, especially considering the price (it is less than $90 at bluedo.com). Mine's taken a lot of abuse over the last two years, but aside from a backlight that died after one too many falls onto a hardwood floor it is still working fine. Nonetheless, I recently retired the MX-500 to the bedroom and replaced it with its big brother, the MX-700. The ability to control additional devices and the greater macro support won me over, since both had the potential to help with controlling a system that had become somewhat more complex since the arrival of an HDTV last year, and the computer interface intrigued me. A little perusing on eBay turned up a brand new MX-700 for quite a bit less than the retail price. The MX-700 and MX-500 are closely related. Both use the same basic shell (although the MX-700 discards a few buttons at the bottom and adds one above the navigation pad), and both have been around for about the same amount of time. 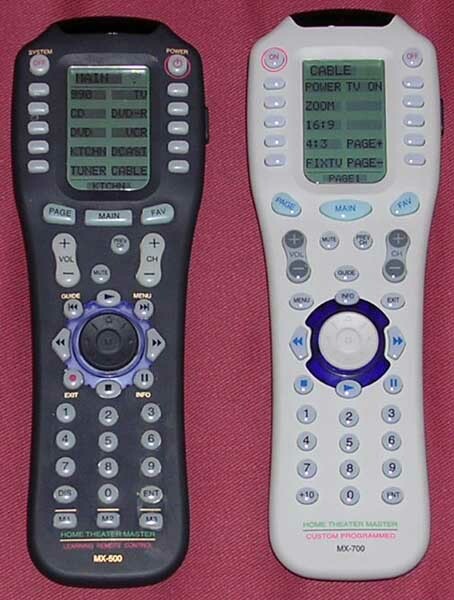 A number of other remotes have appeared in the Home Theater Master line over the last couple years that have built on the very successful core design of these two remotes  the MX-600 and MX-800 added RF capability, the MX-650 and MX-850 have offered slight updates in addition to the RF support, and the huge consumer market for the MX-500 and MX-700 (both of which were developed purely for the custom installer market and were never marketed toward the consumer) produced a brand new line of URC consumer remotes that are simplified versions of the MX-500/700 chassis. The MX-700 is still a classic of sorts, and based on my experience with the MX-500 I felt that it would be an excellent fit for our needs. Having used the MX-500 for almost two years, I had a pretty good idea of what to expect from the MX-700. The unit comes packaged in a simple cardboard box with the remote, serial cable, and four batteries tucked securely into a formed plastic cradle inside. The omission of the MX-500's trio of macro buttons from the bottom of the face would seem to be a minor change, but it actually made the hard button area seem noticeably less congested. The buttons are made of the same material used on the MX-500  the "gemstone" buttons were originally offered only with the MX-700, but Universal Remote began using them throughout the MX series product line a couple of years ago. These buttons have a nice feel to them  smooth, but not slippery. The nearly-white face is also a nice touch, making the remote stand out from the usual black plastic remotes. As mentioned above, the MX-700 package comes with the remote, batteries, and serial cable. That means there is no manual or software in the box. This is because the MX-700 was (and still is) intended as a custom install product, and the custom installers would get a single program CD and user's manual. Fortunately, Universal Remotes had a good web site at the time, and this download page gave me everything I needed. In August 2006, URC scaled back their site drastically and removed the installation software and programming manuals. You can still get the user's manuals from there, but software and programming manuals must come from your authorized distributor. I have mirrored the user's manual, MX Editor, and MX Editor Programming Manual on my site (as well as some other software, listed in the Customization section below), but you should check with your authorized dealer to get newer versions. Now that we've met the MX-700 and gathered the manual and software, it's time to get down to the nitty-gritty: configuring it to operate my devices. This is the biggest difference between the MX-700 and its little brother. The method of configuring the remote using the LCD display (described in my MX-500 review) doesn't work for the MX-700. Instead, the MX-700 is configured through a PC interface. The Excel or Word templates used by many MX-500 owners to mock up their button layouts are readily replaced by the MX Editor program. Where the MX-500 interface is as user-friendly as I have seen in a standalone universal remote, the MX-700's PC-based interface is a whole different beast  it joins the ranks of such software-configurable remotes as the Philips Pronto family. The Pronto can be considered the gold standard for software customization (at least without moving up to the high-end custom market, where manufacturers such as Crestron enter the equation)  its software will allow users to customize every aspect of the interface, including the shape and arrangement of buttons on the Pronto's touch screen. There is not that same degree of control available with the MX-700, if only because the MX-700's button layout is fixed and the LCD screen's buttons are (as with the MX-500) limited to five character labels. While the MX-700 may not offer the level of personal customization of a Pronto, it does provide a convenient interface for configuring the remote. The program contains an extensive database of device codes, and the database is regularly updated through a simple automated download (called Live Update in the software) to include additional codes as Universal Remote adds to their master database. You can download configuration files from Remote Central, either complete remote configuration files uploaded by other MX-700 users or simply individual device configuration files created for a specific component. I downloaded some files that gave me learned remote codes for a few of my devices, but in general I wanted to arrange the buttons on each device in a manner that best suited us, so there was a lot that I simply elected to learn manually. UPDATE: On August 1, 2006, Universal Remote pulled all software from their site, disabled the Live Update feature in existing versions, and revised their policy to only allow authorized dealers to distribute software updates to owners. The goal is to cripple the large number of unauthorized dealers selling products online for significantly lower prices. There are some customer support issues relating to this policy that don't sit well with everyone  the MX-500 and MX-700 have been Internet favorites for years now, and this strikes many as a slap in the face to that user base when Universal Remotes could have chosen to tighten up its distribution channels rather than restricting support to customers. Another unfortunate side-effect is that potential customers can no longer download the software and "test drive" it. I'm not particularly comfortable with Universal Remote's choice, especially since I've long considered their hardware to be some of the best around. For folks considering the MX-700 who may want to experiment with an older version of the software before buying, I've still got a copy of the final "pre-policy change" MX Editor software available for download here. I also have copies of the software for the MX-800, MX-850, MX-900, MX-950, MX-3000, and TX-1000, all the July 31, 2006 versions from before the policy change. I do not have the current (Live Update enabled) versions of any of them, as they must be obtained through an authorized distributor. First, let me touch on some of the MX-700 software's strengths. 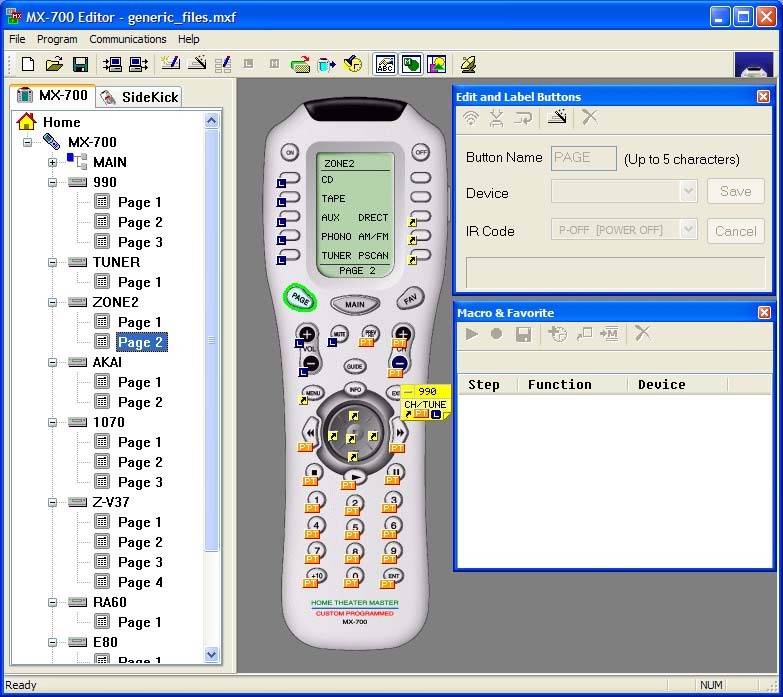 Features such as punch-through and macros are extremely easy to implement, especially compared to the methods usually required for universal remotes. It is also easy to place duplicates of commands from one device onto another device (the program calls these "shortcuts"). For example, every video device I have offers a button at the bottom left of the first page labeled "FIXTV"  this button will send a discrete command to the TV to set it to the appropriate video input for that source device (in most cases, this is component2). Each time I did this with the MX-500, I had to dig out the little Radio Shack remote that was set up with the discrete input codes for the TV and learn the appropriate command to the "FIXTV" button. With the MX-700's software, it's a simple matter of picking "HDTV" from one pull-down, picking the input button from another pull-down, and revising the button label to FIXTV (it automatically changes to match the label of the button being duplicated). And since the shortcut created by this process is a link to the original, revisions to the "master" copy are automatically picked up on any linked copies elsewhere on the remote  this also allows the user to set up much of the remote configuration file without a remote, as the learning process can be carried out later and the links immediately work as intended. Be aware, however, that the shortcuts link to a specific button position on the remote; moving the original button to a different place will break any shortcuts. When learning multiple commands to a device, the software offers a convenient "continue to next button" setting that saves the properly-received code for the button and automatically goes to the next button to wait for the next signal. This "continue" command is a great way to learn entire remotes quickly. Lastly, if you have some learned commands stored in a Philips Pronto format .ccf file (a format that has been in use for a number of years, so there is an abundance of .ccf resources available on the Internet), you can import those commands directly into an MX-700 *.mxf file using the universal browser. The program is not perfect, however, and there are a couple quirks that can be irritating. Re-arranging devices is not an obvious process, although it is easier than I initially believed it to be. While it would seem intuitive to be able to drag a device to a free spot and adjust the layout of the MAIN pages in that way, this will not work. Instead, you cut and paste devices by right-clicking on the device name in the left window, selecting "Cut," creating a new device (pick on the desired button under Main), right-click on the new device in the left window, and select "Paste." A problem I ran into that is not really the fault of the software or the remote is that when learning commands, you need to hold the original button down for a couple seconds, especially for commands that may be able to be sent continuously and continue to cause the component to react (such as volume controls, channel controls, and fast forward controls). Pressing the original button briefly will only learn that brief duration of signal, and all that the MX-700 will do later is send a single brief burst. This is true of all learning remotes that I've dealt with over the years, but it can easily be overlooked by a newcomer to the world of universal remotes. Lastly, since the MX-700 uses a serial port interface (which was the logical choice when the MX-700 was developed, although today the preferred approach would be USB), it takes time to upload or download a complete system configuration  my system averaged a little over a minute. That's not bad, but if your computer is too far from the system to make use of the "test" feature (which allows you to test any command by operating the program's simulated remote through the real remote's IR emitter) and you have to do a full upload to test your setup, you may want to factor this transfer time in. Overall, the software's foibles are pretty minor. The MX-700 offers much more robust support for macros than the MX-500. You can't make any button a macro, but you can assign macros to any LCD button as well as the two power buttons at the top of the remote. That's two buttons per device (including two on the "Main" page) plus anywhere from ten to forty buttons per device depending on how many pages are included. The 50 Favorites buttons are also macro buttons of a sort, although they are intended mainly just as a way to send direct channel numbers. These macros can be very handy. Since the Model 990 allows direct access to radio presets (type in "01" to go to preset 1, for example), I added a page to the TUNER device with macro buttons that went to each preset station. In November 2006, I posted a few tips on writing macros for a new MX-700 owner at Outlaw's forum, and I figured it would make sense to include those tips here as well. This is far from a comprehensive guide on macro writing, but it may help some folks plan their macros. Keep the existing status of devices in mind. This means that a power on/off command for a common device such as TV or receiver should not be used as part of the mode changing macros for each source device, as it will only put the device in the correct state (on) half of the time - the other times, it will turn the device off because it was already on from a previous macro. This is also true of input toggle commands such as those often used to control TV inputs. If you know where the device started out ("INPUT 1" as an example), you can send that toggle command multiple times to get to where you want to be ("INPUT 4" after three toggle commands for this example), but if you can't predict where the device will start out then you can't do this. Corollary: discrete codes are cool. While you can't use toggles for power and input without some care, you can use discrete codes ("power on" or "input3") quite freely. Source selection macros can send a "power on" command to the source to make sure it's on (and if it already is, it'll just ignore it), a specific input command to the TV (to make sure it's on "video3" for example), and set the receiver or processor to the correct input. A global "off" macro can tell every device you have to power off, and you won't have to worry about stuff that's already off getting turned on needlessly. Simple is best. The fewer steps that you include, the less time you'll need to keep the IR emitter aimed in the right direction and the less likely that casual users will be to assume that the remote is finished and set it down or that something is wrong and start messing with it. Some devices need time to think about the commands sent to them. When sending more than one command to a specific device in a macro, test it to make sure that all of the commands are received by that device. Consider locating the commands at opposite ends of the macro (turn the TV on, then turn the cable box and receiver on before telling the TV what input to switch to). If that doesn't work, add a delay before the second command and adjust it up and down until it is just enough to give the device time to recover from the previous command before getting the second one. Be creative. The MX-700 will allow macros on almost any button, which can create some unique opportunities. An example is the macro I mentioned above with the Model 990's tuner and its direct access to presets by typing the two-digit preset number into the remote. Remembering what preset each station is set to can be a pain, so I created a page under the TUNER device with nine or ten macro buttons. Each button was labeled with the station (92.9, 102.7, 99.7, 98.1, and so on), and each button had a macro that sent the corresponding two-digit preset number to the 990. There is a huge collection of files available at Remote Central to help you build your own system file. I've also got my system file available here, along with a number of standalone device files that I have created. I converted several of my device files into a generic format (eliminating some of the commands shared with other devices, such as FIXTV). I'll be posting many of these files to Remote Central in the near future, but they will also remain available for download here. The true test of the MX-700 came when we sat down on the couch with configured remote in hand. Specifically, when my wife sat down with it. She considered the old MX-500 to be one of the best home theater purchases we ever made, so I felt pretty sure that the MX-700 would be at least relatively well received. One of the first things my wife noticed was that the MX-700 is slightly lighter than our old MX-500. She also noticed the fewer buttons on the MX-700, and both of us found that we had to re-learn the hard button layout. The number pad slid down the face some from the MX-500 and is a little more spaced out, the navigation pad shifted very slightly, and the transport controls got shuffled around. Stop moved to the left, play moved from above the navigation pad to below, and the "INFO" button that used to be an alternate label on the pause button moved to the former play button. Newcomers to the MX series will not notice these changes in the least, but anybody moving from the MX-500 will have to stumble a few times. Once we were done stumbling, though, the remote became just as natural as the MX-500 had been. Within less than a week, my wife had quit commenting about the new remote at all. The few programming changes that I made when we switched over were successes (once I got the kinks worked out). Largely because of the fact that the MX-700 was replacing an MX-500, the transition was in some ways anti-climactic, at least at first. The MX-700's greater flexibility allowed me to make changes that lessened the chances of accidental operator error. For example, fast forward and skip forward buttons on the MX-500 are close together, and my wife would sometimes skip to the next program on the DVD-R's hard drive when she just wanted to fast forward through some ads. The MX-700 assumes that you will use the channel up/down buttons for skip buttons, but on a DVD recorder that has a cable tuner you need to use them for channel control, so I moved the skip forward and back buttons up to the LCD (safely removed from the fast forward buttons). I also revised the system on and off macros to reside on the "ON" and "OFF" buttons instead of the "M1" and "SYSTEM OFF" buttons, which has been a more logical arrangement. The last significant setup change was the standardization of a few commands: each video device (cable box, DVD players, DVD recorder) has a "TV ON" button at the top right corner of the LCD and a "FIXTV" button at the bottom left. This makes it easy to make sure everything is turned on without having to hunt around. As part of the MX-700's expanded macro support, each device button (the buttons on the LCD screen when in "MAIN" mode) can hold a macro, which is triggered when you select that device to handle things like changing the input on your receiver or selecting the appropriate input on the TV. This is similar to the MX-500's ability to store a single command on each device button. In the case of the MX-700, however, you can also bypass the macro (such as if you want to select a device just to turn it off without having the system switch to that source) very simply  just hold down "MAIN" while selecting the device button, and the MX-700 will skip the associated macro. This is much easier than the alternative that I always used with the MX-500 (covering the IR emitters with my hand). 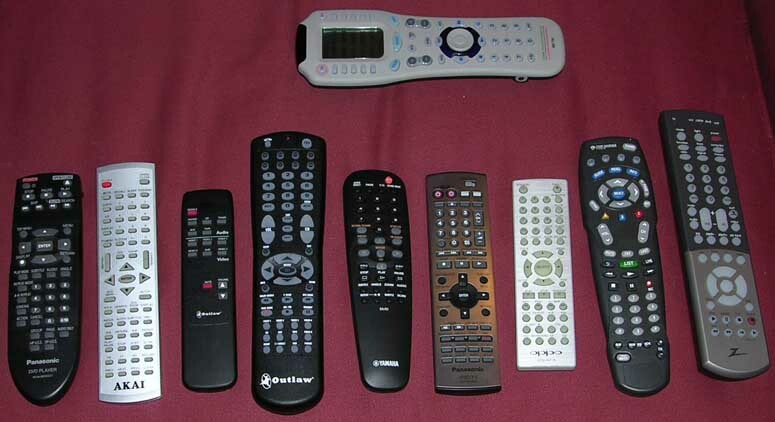 The picture above shows most of the remotes that were transferred into the MX-700. A few device remotes are missing (the Model 950's remote was gone by the time I set the MX-700 up, and the VCR's remote has been dead for several years) and a few are not used in the main system (such as the previously mentioned Model 950 and the Panasonic DVD-RA60  these were added to the MX-700 just so I'd have the device files handy if I needed them). That's two surround sound processors (including a separate remote for one processor's second zone), three DVD players (two of which are in use in the system), a DVD recorder, a cable box, an HDTV (including a Radio Shack OFA remote with some additional discrete codes), a VCR, and a combination TV/DVD player in the kitchen. The MX-700 was able to corral all of those remotes into a single body while still making it easy to get to everything. Heck, I could have even tossed in the TV and DVD player from the bedroom if I'd wanted to and still had room for more. The MX-700 can handle a whole lot and still be user-friendly about it. Once you get it adjusted to best suit your needs, it can make even the complexities of a modern home theater system manageable for the whole family. The MX-700 was developed as a high-end, highly customizable remote that could be used by custom home theater installers who develop turn-key home theaters and need to be able to hand the customer a single remote that can easily control the entire system. It proved so effective in this role that the Internet's community of home theater hobbyists began seeking it out as a sort of hard-button equivalent to the Philips Pronto, even though the MX-700 and the equally popular MX-500 were never intended for sale directly to the consumer. This popularity is certainly part of the reason that Universal Remote developed the URC line of consumer remotes, and that the line is so clearly descended from the MX-700 and MX-500. The interface of the MX-700, as with its sibling the MX-500, is a very user-friendly balance of traditional "hard buttons" and customizable buttons that can help tame even the toughest home theater, making it easy to control not only for the person who set it up but also for others in the household who want to use it. If you are looking for a decent universal remote at a good price, you should probably aim for the MX-700's little brother, the MX-500. It can be had from online retailers for under $90, and it offers most of the MX-700's strengths for a great price. The MX-700's list price of $350 makes it a harder sell for most users. These days, though, brand new MX-700's can be readily found on eBay for $150 to $185, making the remote a bit more financially accessible. For the "tweaker" home theater hobbyist, the MX-700 is a wonderful tool. The computer interface for programming affords you convenient and detailed access to customization as well as the ability to both back up and share configurations. While I will continue to recommend the MX-500 as a first-rate universal remote, the MX-700 is clearly a step up for those home theater folks who demand a lot from their remote. If you have any questions about this review, click here and I'll get back to you as quickly as I can.